The online version of this article ( https://doi.org/10.1007/s11295-019-1320-2) contains supplementary material, which is available to authorized users. Whole-genome resequencing, SNP/indel calling, and SnpEff analysis for the 544 individuals of this Populus GWAS population was previously described by Evans et al. (2014). In this study, we used the same sequencing and analytical pipelines to incorporate an additional 373 accessions (altogether 917 accessions). Briefly, reads were aligned to the P. trichocarpa reference genome version 3 using BWA 0.5.9-r16 with default parameters and SNPs and indels were called using SAMtools mpileup (-E –C 50 –DS –m 2 –F 0.000911 –d 50000) and bcftools (-bcgv –p 0.999089). 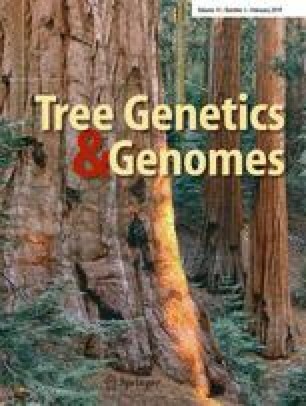 The resulting SNP and indel dataset is available at http://bioenergycenter.org/besc/gwas/. The resulting SNP and indel dataset is available at http://bioenergycenter.org/besc/gwas/. To assess genetic control, we used the EMMA algorithm in the EMMAX software with kinship as the correction factor for genetic background effects (Zhou and Stephens 2012) to compute genotype to phenotype associations using 8.253,066 SNP variants with minor allele frequencies > 0.05 identified from whole-genome resequencing. Linkage disequilibrium (LD) was determined using HAPLOVIEW v.4.2 (Barrett et al. 2005). To account for multiple testing, we used the Bonferroni correction and considered as significant only those SNPs for which P < 0.05/8253066 = 6.06910−9. This correction is known to be conservative and thus “overcorrected” the raw P values (McIntyre et al. 2000). Support for the phenotyping and graduate support for Roba Bdeir was provided by the USDA-NIFA grant (# 2012-67013-19389) to VB, YY, and OG. Additional partial support for Roba Bdeir was provided by the National Science Foundation grant to OG (# 1230803) as part of the “Sustainable Forest-Based Biofuel Pathways to Hydrocarbon Transportation Fuels” project at Michigan Tech. The Center for Bioenergy Innovation is a U.S. Department of Energy Bioenergy Research Center supported by the Office of Biological and Environmental Research in the DOE Office of Science. This work was supported by the U.S. Department of Energy under Contract to Oak Ridge National Laboratory. Oak Ridge National Laboratory is managed by UT-Battelle, LLC for the US Department of Energy under contract number DE-AC05-00OR22725. We also acknowledge support from the German Research Foundation (DFG) and the Open Access Publication Funds of Göttingen University.